Last week, I participated in a puzzle event where we handed out a bunch of outdated data storage devices to people and they had to figure out how to read them. Among the obsolete technology was a roll of black and white film, which should give you an idea of just how far photography has come. In the digital age, photography is a whole new world, and the newer photograph apps in particular just blow me away. ColorBlast is one such app that inspired quite a bit of oohing and ahhing. Like the popular ColorSplash and other similar apps, ColorBlast lets you change photos into black and white and then add color back into specific places. It’s a neat visual trick and one that used to only be possible with a lot of careful fiddling in Photoshop, but ColorBlast takes a lot of the tedium out of it and leaves you with beautiful results. Most of these color editing apps have you carefully painting colors onto your black and white photo, and ColorBlast can do the same, giving you a paint roller tool that lets you slap on whatever color wherever you please, as well as a spray paint tool which does effectively the same thing, but with a softer spray can effect. Now, that’s all well and good, but the really nifty thing ColorBlast brings to the table are its “magic” brushes. These brushes effectively let you paint a single color back into the photo. For example, let’s say you just want to bring the color back into the carrot nose on a snowman. All you have to do is touch the carrot, and as long as you don’t lift your finger back up, you will only bring back the orange in the photo. The white snow or green trees in the photo should stay more or less the same, which makes the coloring process quick and easy. Switching between the brushes and erasers on the fly is trivial, and it’s also very simple to undo or redo a step as you work. There are also handy sliders to let you adjust hue, exposure, and saturation, so changing the look or color of whatever you’re working on is simple as swiping your finger. 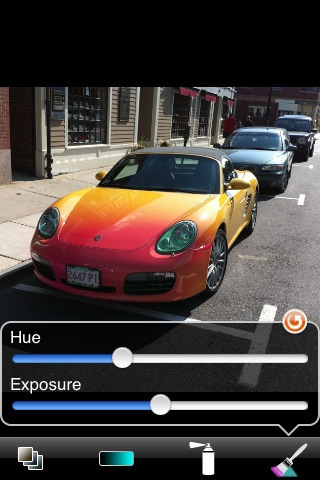 Of course, as impressed as I am with ColorBlast’s interface, it still has a few issues that keep it from being perfect. 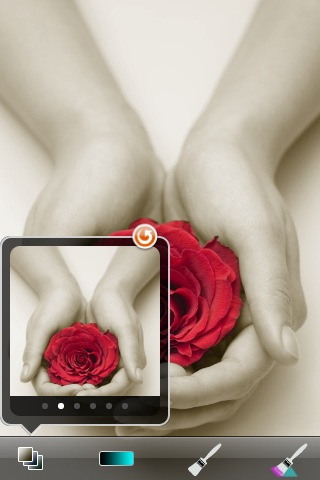 The biggest one is the actual touch interface. Instead of using an offset circle to let you see what you’re doing, you really have to zoom in very close and pay attention to the individual pixels if you want to get the edges precise. I found myself wishing my fingers were smaller as I worked, which was less than ideal. The two-fingered dragging was also surprisingly fussy, especially considering that the zoom feature worked fine. Want a real world example? 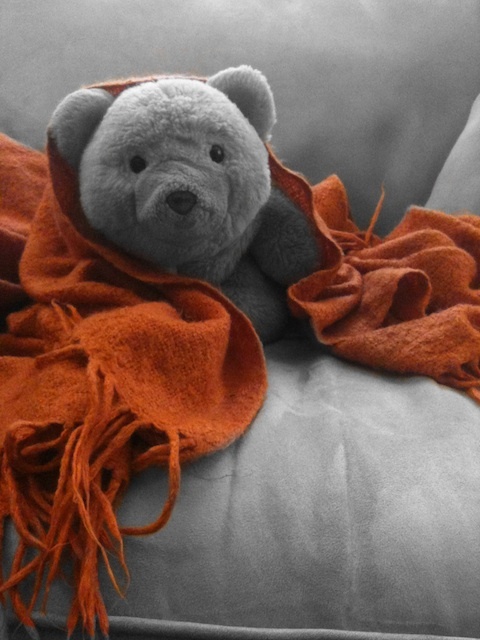 Here’s a Teddy Bear photo I personally colorized using the ColorBlast iPhone app. Still, despite these minor flaws, I was very pleased with the results, and I had a gleeful time posing my teddy bear with various brightly colored objects to test ColorBlast out. It’s not quite perfect, but it’s definitely a cut above the rest and miles easier to work with than Photoshop. AppSafari review of ColorBlast! was written by Tracy Yonemoto on January 25th, 2011 and categorized under App Store, Art, iPad apps, Photos. Page viewed 3552 times, 1 so far today. Need help on using these apps? Please read the Help Page.